Clarification: The sunrise image is part of a tourism video promoting China's Shandong province. 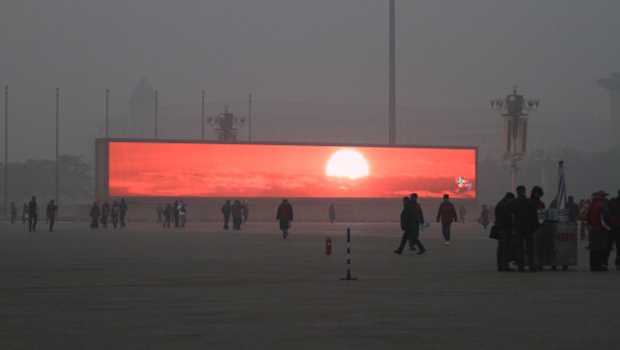 A big screen located in Tiananmen Square has been displaying tourism advertisements. These videos feature many scenic beauty shots. It was just a coincidence that the sunrise image was shown on a smoggy day. The original story has been edited to make this clearer. The ruby red sunrise was quite stunning from Tianamen Square. But the thing is, it wasn't actually real. Like something out of a sci-fi novel from 50 years ago, for a brief moment Thursday, residents of Beijing found themselves looking at alternative versions of a landscape they can't see anymore due to high levels of smog. High-tech screens placed around the city's capital advertise tourist attractions. These tourism promos run in loops, and naturally they contain a lot of beautiful scenery. It was just a coincidence that the dramatic sunrise was shown on a day when heavy smog blocked the sunlight. But the image seems to come straight from George Orwell, or any number of prescient novelists who could predict the end effect of rampant air pollution. According to Reuters, Beijing saw the season's first wave of extremely dangerous pollution, with the concentration of toxic small particles registering more than two dozen times the level considered safe by the World Health Organization. Thursday marked the highest air density reading since January 2013. "The smog has gotten worse in the last two to three years," said a traffic coordinator who gave only his surname, Zhang. "I often cough, and my nose is always irritated. But what can you do? I drink more water to help my body discharge the toxins."